The reason why many people do car detailing in the first place is to give their ride the best car paint protection coating there is. Modern detailers will swear by car paint sealant. But others will still go with the more traditional favorite, carnauba wax. There’s an ongoing debate whether sealant or wax is the way to go when it comes to surface protection. But rest assured that whatever you choose, both waxes and sealants will give your car the mirror-like shine you want. Since auto paint sealant is a newer product in the car care market, it’s a good idea to find out just why auto enthusiasts are clamoring about it. Find out more about paint sealant, what it does, why it’s effective, and show off your new-found knowledge with your auto-loving friends! 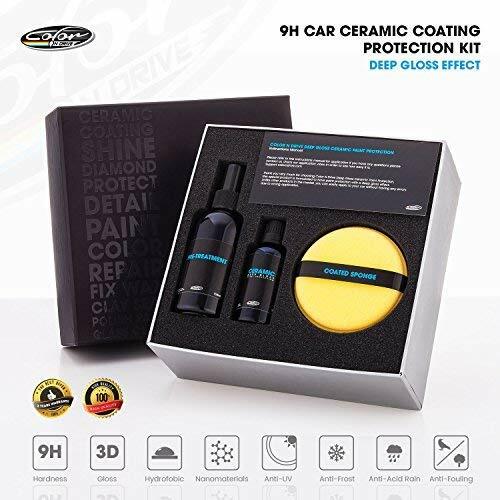 Discover the best protective coating for cars! Of course, you only want the best car paint protection there is! A synthetic paint sealant is a great option that’s designed to give your vehicle a finish that will beautifully glaze in the sun while providing your exterior with a durable shield against surface contaminants. There are many auto paint sealant protectant products available in hardware stores and online that will give you effective results. Some of these brands are like the Wolfgang, Meguiars, and 3M, and they can be conveniently found on Amazon. But first, you should equip yourself with some knowledge about car sealant so that you can utilize this product to its fullness. When to use car paint sealant? Where to buy car paint sealant? How to protect car paint? How to apply paint sealant for a car? How to remove car paint sealant? How long does car paint sealant last? How long does car wax last? That’s right! The very first question you need to be answered is: what is paint sealant for cars? It is made up of polymers, which are thousands of synthetic particles that sit atop your car’s surface to provide it with this hard shell-like shield. While it doesn’t give as much depth and clarity as natural carnauba wax, a synthetic paint sealant ultimately lasts longer. A high-quality sealant can last up to 6 months while some of them can even last you up to a year. They’re also very easy to apply so you won’t have any problems with that at all. When it comes to durability and overall protection, sealants are the way to go. They’re created from modern and the most advanced technology today. Chemical engineering professionals have studied, researched, and formulated these products to give you only the best defense your car deserves. Let’s face it. ‘Best’ is subjective, depending on what each car owner wants and needs. That’s why it is true that a paint sealant might not be the best choice if you’re going for the ultimate visual enhancement you could possibly achieve. Traditional car wax is still better at that. But, if ‘best’ for you is primarily protecting your car from the harmful ultraviolet rays of the sun, annoying watermarks, and other surface contaminants; then a car paint sealant is the way to go. 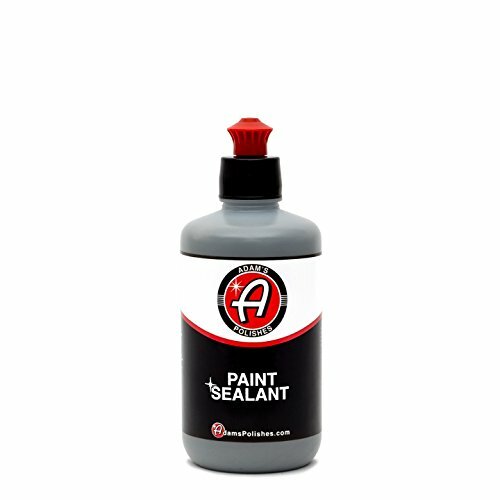 Paint sealant is widely available in stores and online. Many online shops carry their own brands and other brands. Amazon has tons of car paint sealants conveniently curated in one site so that you can buy your stock hassle-free. Of course, you can also choose to go out and buy it from the nearest hardware store or automotive shop if you like. Car paint sealants are not hard to find so you won’t have a problem looking for it. Or, to make your life easy, we have curated a list of best car paint sealants that has ample of good ratings as well as high customer satisfaction, and you can read the product review below. There are a lot of ways to protect your car paint, and some ways are better than others depending on what you need. Using a paste car wax on your car is fantastic if you want the most amazing shine. And yes, most waxes today are created to provide protection from pollutants as well. But that won’t beat the total protection that car paint sealant can give. If you want maximum defense, it all starts out with your car washing, polishing, and application of the paint sealant. Paint sealant is typically applied after car wax is done or use as a standalone. The sealant adds another layer of protection on top of the wax and enhances the gleam further. Sometime when you visit a car detailing center, a costlier package will include a multi-layer wax detailing and sealant is one of the layers. It also does well to remember that you will need to use only the highest quality of auto accessories like a microfiber towel and soft foam pads when comes to auto detailing. Using top-notch dual orbital buffers can be a great help, too. If you want to know more about how to protect your car paint the professional way, read this article by Popular Mechanics. Now that you know what a paint sealant for cars is, the next question to ask is: what is the best car paint sealant? Well, it really depends on your need and preference. What might be the best car paint sealant for you, might not be the one for others. That’s also true if you’re looking for a paint sealant for new cars. Really, you still need sealant even if your vehicle is brand-new! The best car paint sealant for your new car should be one you’re definitely confident in. With how busy the world is today, you’re probably someone who wants to make the most out of your time. Well, a hassle-free car maintenance routine with fewer steps is something you will definitely want (and need)! 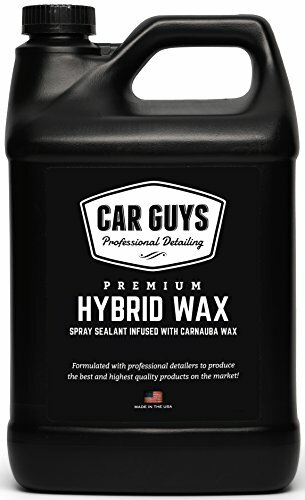 This synthetic polymer sealant from CarGuys is the perfect product if you don’t like buying a lot of auto care products. With this excellent hybrid, you can get the most sought-after properties of both a car wax and car polish. It has carnauba paste so you can get the traditional show-stopping shine you want. It also has fine abrasives that can keep your surface super smooth. Not only that but it mixes both traditional and synthetic qualities that will give your car double the protection that is superior in its durability and staying power. It’s very resistant to damaging pollutants like chemicals, acids, and minerals that can easily scratch your paintwork. Not only that but it can also restore fading paint with no problems and can even prevent further discoloration! But that’s not all. It also works well with chrome and glass parts, so you don’t have to worry about messing those up. Best of all, this hybrid sealant is non-toxic and environment-friendly, so it’s safe to use as much as you want! Traditional waxes may be known for giving the best shine, but the deep gloss of this Wolfgang sealant can easily compete with that! It can definitely enhance the look of your ride, no matter the type and color of your paint. This world-class product was the result of a multi-national team. An American automobile business enthusiast knew that there was a demand for the deep, clear gloss you get from traditional wax that can last longer. So he decided to create the ultimate Concours dream product! He partnered up with expert German chemists and used the German super polymers that have been reinforced to have dirt-repelling powers that can keep your car shining a whole lot longer. But not only that, this product even has anti-static properties that can easily repel contaminants like water, dirt, oil, and road debris. That’s what you call maximum protection! 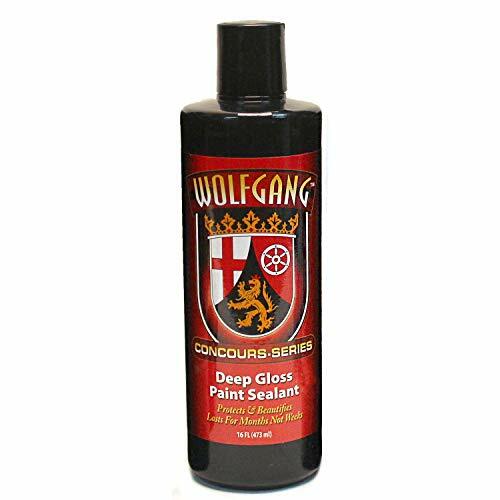 If there ever was a dream car care product, this sealant from Wolfgang is probably it. It has magnificently balanced the characteristics of both natural and synthetic to provide you with the best of both worlds! Another excellent paint sealant to look into is this one from Car-Show 1. It allows you to forego some steps like polishing and waxing since it can do both jobs effectively. It has incredible hydrophobic qualities that make water bead off of your paintwork. Say goodbye to water spotting! But not only that! It also provides your ride with resilient UV protection so you don’t have to worry about oxidation and photodegradation. The extra layer it creates on your auto’s surface provides a great shield for a lot of contaminants. And who couldn’t say no to the deep, mirror-like shine it gives! You can apply it on any color and the reflectivity will just blow you away! You can even use it on other vehicles like boats, planes, and motorcycles to keep them looking amazing and give them the same great protection they need. You know you’re getting a quality product because this is one that’s made by customers’ feedbacks. Adam’s pride themselves on good customer service and they want to give you what you want. That’s why when customers clamored for less curing time and hand application, they created the Adam’s Paint Sealant. With this product, you don’t need to pull out your polisher. You can easily apply this on your surface manually. Protect your surface quickly and thoroughly by using a soft foam pad or a microfiber applicator. But if you’re someone who loves using your detailing machine, go ahead! Whether you choose to apply it by hand or machine, this product goes on evenly and sets quickly. You don’t need to wait for long curing times! It hazes up fast and you can add another layer for better protection, all in a matter of minutes! Plus, this sealant was formulated with the latest acrylic polymer technology, so you know you’re getting only the most durable protection you deserve. It can withstand harsh conditions and even harsher detergents. All that long-lasting protection isn’t the only thing Adam’s Sealant can give. It also provides your ride with an amazingly rich gloss that you will definitely love! 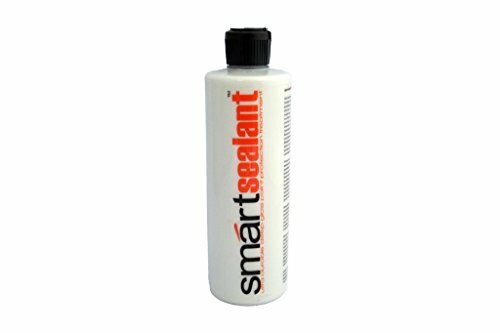 Smartwax 20103 SmartSealant Deep Gloss Car Paint Sealant and Protectant - 16 oz. When it comes to high-quality automobile maintenance products, traditional and synthetic is sometimes just not enough. You need something that has both of their best qualities mixed together in one product. The Smartwax Sealant Protectant is just that! It is formulated with detergent-resistant polymers, pure carnauba wax, and natural oils so it not only gives the best paint care there is but it also provides really reliable defense. The people behind this product know that paint is always under attack whether your auto is in use on the road or parked under the sun. So, they made sure that the sunscreen-like properties in this sealant are extra strong to better perform against UV rays. But that’s not all! It also has anti-static ingredients that help keep your vehicle clean for longer. With regular use (6 to 12 months reapplication! ), you can even prevent oxidation and paint fading. Plus, it easily seals out corrosive elements like saltwater on the road during the winter and acid rain so you’re also defended against rust! Some sealants work great depending on the color of your ride. Sure, that works if you only have one car or a fleet of them with the same color. But you can always use one that works for multiple colors. That might be a more cost-effective way. Don’t let the name deter you. 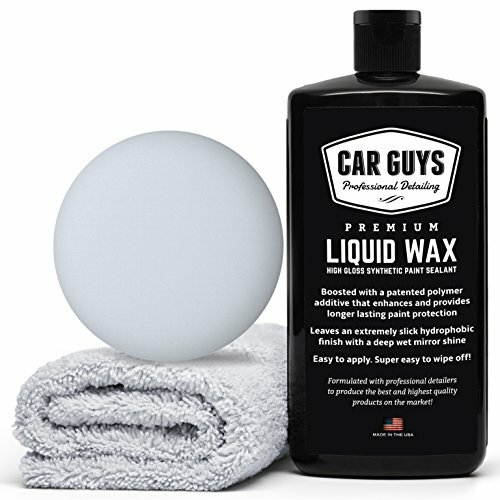 This ‘car wax’ is created by highly advanced polymer technology and it’s in liquid form so it definitely counts as a sealant. If you’re looking for long-lasting, this is the perfect product for you! It lasts for a whopping six months or more, depending on your car’s situation and your environment. That’s twice longer than your average car wax. It has high longevity characteristics that provide a very durable shield against environmental pollutants like the harmful UV rays of the sun and water damage. But it also has a little bit of the natural properties of carnauba that allow you to give your auto the very best shine it deserves! You can use it on black, white, red, or whatever colored car you have! It’ll still give you a depth and clarity that’s to chase after for. You can even use it on your RV, motorcycle, boats, and other vehicles! But that’s not all! You can use it even during the harshest weather conditions. It doesn’t matter if you love somewhere sunny and dry or stormy and wet, this product can take those conditions and still give your paintwork the protection and look it deserves! You’ve seen a lot of natural wax and synthetic sealant combos, but if you’re looking for a less popular mix, then this one by Chemical Guys might be up your alley. They’ve combined the advanced technology used in sealants with the high gloss capabilities of a quick detailer. Now, waxes are great for Concours shows, but you know that quick detailers are as good when it comes to giving quick and easy optical clarity! The Hybrid V7 is no exception. Its formulated to remove any imperfections caused by dust, dirt, and road debris while giving your car a blindingly high-quality shine. Its formula uses advanced nano-spec engineering which makes it bond faster with your surface. It almost disappears completely on your surface so you wouldn’t have to worry about streaking. The advanced polymers in its makeup are not only transparent for a clearer and more beautiful finish. But it can also protect your paintwork from the harshest of elements. New technology usually means better performance with more added benefits, and that’s what this paint sealant from Color N Drive gives to you and your awesome ride. Yes, it has most of the same incredible benefits that any synthetic polymer paint sealant can give you like durable protection and high gloss. But it just levels it up even more! With their highly advanced Nano-Bionic ceramic technology, not only are they giving you these well-loved benefits but they’re also throwing in amazing self-cleaning properties as well as extreme hydrophobic qualities as well. Yes, that’s right! Get ready for the ultimate water beading experience. Plus it also has anti-calcium characteristics so no longer will you complain about water spots because there won’t be any. It also has anti-static and self-cleaning properties that will repel dust and dirt from your paintwork. But it doesn’t just protect from minor visual annoyances. It also provides a very strong and long-wearing barrier against UV rays (so don’t worry about fading and oxidation) as well and acid rain! You’re guaranteed that your vehicle is very well protected. 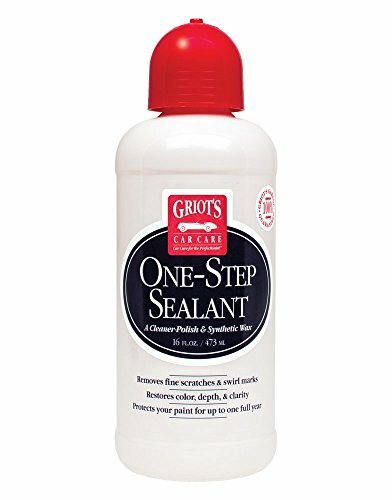 Last but definitely not least on this list is this one-step sealant from Griot’s. Shortening the time you need to detail your car is a good thing for every car owner (regardless if you’re an avid auto lover or not). This paint sealant from Griot’s not only given ample protection but it can also remove unwanted surface imperfections! So it’s like a polish and a sealant in one! Say goodbye to swirl marks, light scratches, and oxidation because this sealant can gently erase those for you. Plus, it lasts for a very long time! Durable protection for one whole year? You bet! It gives amazingly clear, deep gloss to your finish and provides excellent defense from contaminants for up to 12 months. Griot’s definitely knows that time is golden. That’s why it shortens your detailing project and lengthens the time between reapplications. One problem many customers face today is the misinformation on both carnauba car wax and the new car paint sealant. If you’re just a regular car owner, chances are you already think they’re the same and that marketing people are just creating buzz for their products. Well, they’re not. If you want to do DIY projects in your own garage to help your ride’ get shinier and more protected, it will be helpful to learn the difference between the two auto products. By doing so, you can get the one that fits your needs the most: whether that be sealant or wax. Learn more about the different between sealant and wax in this post. Before going into the more confusing pairing, it’s a good idea to know what the difference between polish and wax is. Before car paint sealant is introduced in the auto market, people were already confused by these two products. Polish is primarily used to get rid of surface imperfections like grime, scratches, and scrapes. It is made up of very fine abrasives that smoothen your paintwork to give it a glossy finish. It does not provide any added protection. Wax, on the other hand, creates an additional layer of shine that gives extra defense from pollutants like watermarks and UV rays. It also provides that glass-like gloss that every autogeek wants. There are also specialized products created under this category, like the best car wax for black cars and the best car wax for white cars. That’s why it’s a good idea to read car wax reviews if you’re thinking of buying one. Unlike polish and wax, sealant and wax are more similar in what they do. They both provide extra protection and both give extra shine. But, of course, some significant differences are still there to make you consider your choice. Waxes come from natural origins. Many waxes are used to create this kind of auto product, from animal waxes like beeswax to plant-based ones like carnauba. While they offer another layer of defense against contaminants, waxes are more known for giving award-winning shine. They are also easy to apply but requires a bit of effort. Sealants are entirely human-made. They are created from synthetic polymers through the thorough research taken from modern technology. Although it gives a great mirror-like finish, it gives more importance to durable and long-lasting protection. Sealants are very easy and quick to apply. It’s all up to you to choose what you prefer. Reapplications are regularly easier and fewer with sealants, but waxes give you the best visual enhancement. Price isn’t something to worry about as both products have brands that range from affordable to first-rate. A polymer sealant is actually any kind of car paint sealant. This is because car paint sealant is created with synthetic ingredients called polymers. A polymer is a long chain of chemicals with repeating components. These long chains allow the car paint sealant to create a very durable protective barrier that has the same sturdy properties as rubber and plastic. Although car paint sealant is exceptionally durable and long-wearing, it doesn’t last forever. The protective barrier created by the sealant absorbs the damage that would have been inflicted on the car, and that’s why it wears off with time. You would need to re-apply auto paint sealant after 6-12 months. Learn more about the polymer sealant in this post. Ceramic paint protection (such as the one listed here) is a liquid polymer that is applied by hand or machine to the exterior of a vehicle. The coating chemically bonds with the vehicle’s paint, creating a layer of protection. In short, this coating is to provides your vehicle’s paint more resilient and easier to wash off the dirt. Although ceramic coating provides some level of protection toward small scratches but it will not be completely resistant to the risk of rock chips or parking lot scratches. Also, improper washing of car will still create swirl marks on your vehicle’s surface and water spotting may still present even your vehicle is protected with this coating. The brand Wolfgang Concours-Series isn’t a classic. It’s too young to be one but gives it a few more years and it would probably have legendary status already. After all, the team that created it and the technology used to make it is the ultimate Concours dream! If you loved the Pinnacle Souveran, then you’d probably want to try their products. Wolfgang is created by the co-owner of this fantastic brand and by expert chemists from Germany with the use of innovative Japanese technology. That’s what I call world-class! With just the company’s background, you know that their products will give you only the best performance, and one of them is the Wolfgang paint sealant. Not only does it provide your car with maximum protection but it also allows its surface to shine with a beautiful, deep gloss. Click here to learn more about Wolfgang paint sealant and why we think it’s one of the best sealants in the market. Whether you’re a certified auto enthusiast or just a regular car owner, you probably know Meguiar’s. It’s a well-known brand, after all. It might even be the most popular automotive brand in the world. With over 100 years of experience, this cult classic has provided generations of car owners high-quality auto products that still work today. And with their continued prowess for more advanced technology and automotive knowledge, they are still innovating new lines to serve all auto owners better. What started out as a business selling furniture polish now sells the most sought-after car care products, and one of those is the Meguiars paint sealant. You can find two different kinds of paint sealants in one of their professional lines, the Mirror Glaze. Choose between the M20 Polymer Sealant and the M21 Synthetic Sealant 2.0. Click here to learn more about Maguire’s Sealant and you ought to check out their fantastic sealants! 3M is another well-known brand. It’s most notable for its high-quality adhesive products. From DIY projects at home to industrial endeavors for your booming business, 3M has a product you most definitely will need. It comes as no surprise that it has also entered the automobile industry. In fact, it has many top-notch products that you can already avail (and many people already love as well). When the time came for car paint sealants to get into the spotlight, 3M also delivered. When you’re looking for a very specific sealant, there’s a big chance that 3M has it. There are many different kinds to choose from when it comes to 3M paint sealant, from a line made if polyurethane to one specifically designed for marine use. Check out this article to find all the best 3M car paint protection that is available for you. How to Apply Paint Sealant for Car? Washing your car thoroughly cannot be stressed enough. It all starts here. How good your protective coating bonds with your surface is determined on how squeaky clean that surface is in the first place. If you want the best result, make sure to be thorough even at the very beginning. Clay barring is a relatively new thing in the auto industry, and many people think that it’s just another gimmick to increase sales. Be that as it may, using a clay bar really helps get rid of fine surface contaminants stuck in your paint so it’s still a good idea not to skip this step! Using polishers on your car should come first before waxing because you don’t want any imperfections permanently sealed. It’s better to get rid of scratches and swirl marks first. The term ‘wax your car’ doesn’t just pertain to actual wax. It means apply whatever paint protection product you’re going to use. Car paint sealant is very easy to apply. It’s always in liquid form and can be applied by a soft foam pad or a dual action polisher. If you want a quick and easy process, paint sealant is the way to go. For a more in-depth guide on how to apply paint sealant and protect your car’s surface, read this article from Autopia Car Care. There are many ways to remove car paint sealant. The bottom line is, you want the water to stop beading. That’s when you know that the old sealant is gone. One way to do this is to use a good quality pre-wax cleaner. 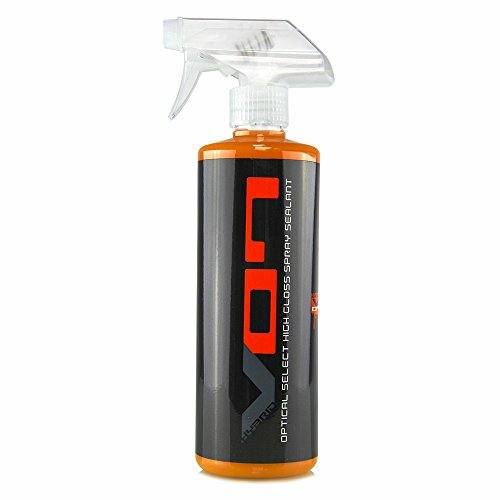 These products are specifically designed to remove any old product safely while giving your vehicle added gloss. You can also increase the ratio of the car soap you’re using just to add a little more abrasiveness to it for better sealant removal. Modern technology has allowed professionals to perfect (or at the very least, improve) paint protection. Most synthetic polymer paint sealants can last up to 6 months, which is double the length that a regular car wax lasts. Some high-quality auto paint sealants can even last up to 12 months! Most car waxes don’t last as long as their synthetic counterparts. The typical lifespan of car wax is 4 to 6 weeks. So if you’re going to use that, remember to re-apply about every 3 months. The Important of Rust Proofing for Vehicles & Why Your Car Need It? Sealant vs. Wax: Which Offer Better Car Paint Protection for Your Vehicles?